"I do believe that Al Jazeera and other channels were not balanced in dealing with the events," he said. "For instance, with respect to the events in Syria and Bahrain, we started to invite guests from America who only criticize the regime in Syria and support the regime in Bahrain and persons who justify NATO intervention. This is unacceptable." ^ "Pakistani troops aid Bahrain's crackdown". Al Jazeera English. July 30, 2011. Retrieved February 12, 2016. ^ "Pakistan not sending troops to Bahrain or Saudi: PM". Dawn. March 24, 2014. Retrieved February 12, 2016. In 2011, Pakistan had helped Bahrain quell an uprising against the monarchy by sending security personnel recruited through military’s welfare wings – Fauji Foundation and Bahria Foundation. ^ "Bahrain king declares martial law over protests". NBC News. 2011-03-15. Retrieved 5 August 2015. ^ Erlich, Reese (December 12, 2012). "Bahrain's Changing Opposition". Global Post Public Radio International. Retrieved 10 February 2018. 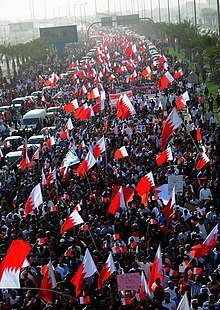 ^ "Bahrain holds disputed election". BBC News. 2014-11-22. ^ "Bahraini authorities execute three Shia Muslim men convicted of killing an Emirati police". The Telegraph. 2017-01-15. ^ "164 Protesters Killed in Bahrain since Start of Uprising: Opposition". Tasnim News Agency. Retrieved 2014-05-29. ^ "Government withdraws permission for visit by freedom of expression NGOs". Reporters Without Borders. 2012-05-04. Retrieved 15 May 2012. ^ "Media freedom flouted during Grand Prix, government PR operation flops". Reporters Without Borders. 2012-04-20. Retrieved 15 May 2012.